Hydrocarbon organic material, as found in the interstellar medium, exists in complex mixtures of aromatic and aliphatic forms. 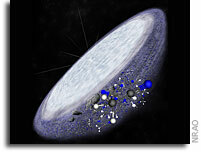 How soon after the Big Bang could water have existed? Not right away, because water molecules contain oxygen and oxygen had to be formed in the first stars. Methyl acetate (CH_3COOCH_3) has been recently observed by IRAM 30 m radio telescope in Orion though the presence of its deuterated isotopomers is yet to be confirmed. It is long debated if pre-biotic molecules are indeed present in the interstellar medium. Despite substantial works pointing to their existence, pre-biotic molecules are yet to be discovered with a complete confidence.